I have this spot on my kitchen counters that is generally used as a landing spot for all sorts of random things. 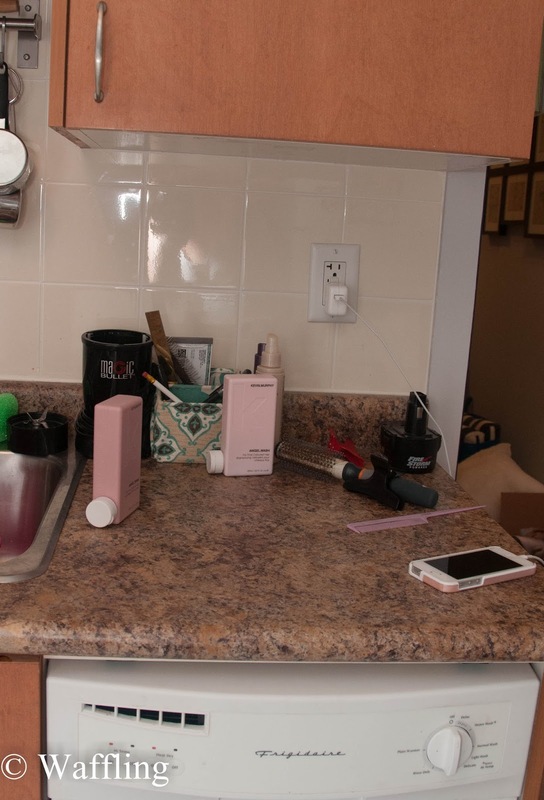 I don't really use this little bit of counter for cooking or baking unless I am doing a really big recipe, so it generally collects other things like my Magic Bullet, my hair things, plates, bills, and random junk. Everything else I need to stay on the counter. The pink things are my shampoo and conditioner. I wear a wig and wash my hair in the kitchen sink with the vegetable sprayer so I need to keep this kind of stuff in my kitchen. I have tried keeping it in the bathroom but it always comes back out and then I am too lazy to put it away. I have a theory that everything looks neater when in a tray. I did this in my bathroom and never looked back! So for the past little bit I have been on the lookout for the perfect tray for this space to corral all these random things- and last night I finally found one at Marshalls. Oh and this isn't a wide-angle trick, the long edges are actually curved. I love that all these random things finally have a pretty place to go and that more than half the countertop is now clean (and ready for more dirty dishes to pile up on it). 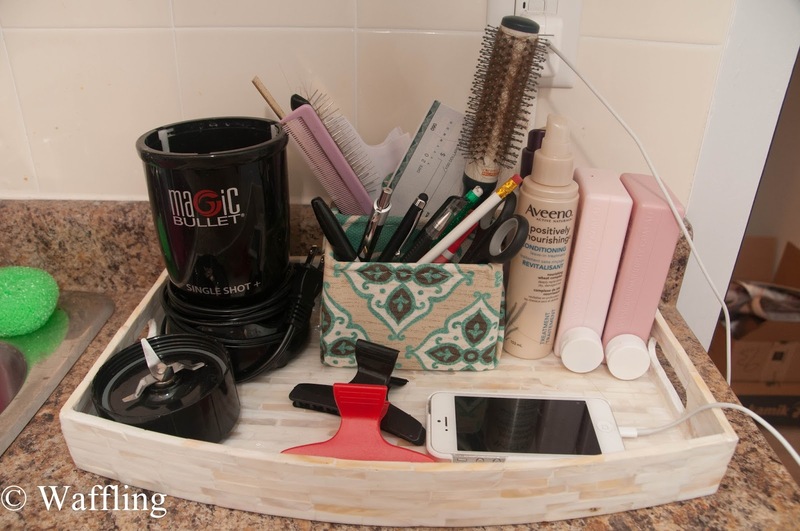 Do you have a go-to trick for looking instantly organized? My papertowels are under the sink. I dont really have any cupboard space for the magic bullet! and I think she just thinks it is a boy. I thought she said the baby didnt show the goods? I love how you used trays. I never do but then again, I have a huge kitchen where I can just jam everything into a cupboard. It looks beautiful though and I LOVE that tray. The rounded edges are beautiful. Yes, my cupboards are full utilized so I need to have things out!! I really like them. I saw a set of breakfast in bed trays at that store on the Danforth, Moss, and wanted to buy them for counters. BUT they weren't small, and at like 30$+ a piece I accept my dollar store solution for now. But lovin' yours. Im sure the dollar store has nice trays- I have an ikea one for the patio that is adorable and cheap! This looks awesome, Casey! I agree that things look more organized on a tray! New Wig in the Works!